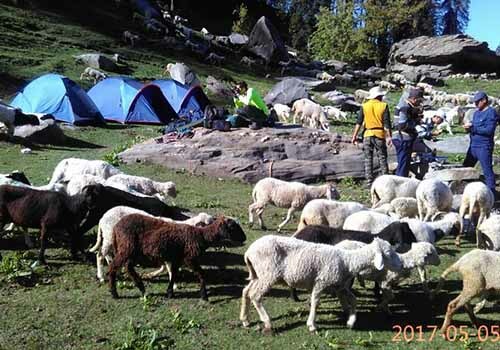 The Deo Tibba Circle Trek is a beautiful trek which gets you into lush green Grazing Lands, Forests filled with Coniferous Trees, Waterfalls and Moraines. Hypnotic views of the Manali region can be viewed from the highest point of this Trek. Thus, creating a long-lasting impact on your pleasant list of memories. Best Time – Mid-April to July End, Early October to Early November. Meet at 8 am at Rambaugh Circle Manali. We will drive to Aalu Farm in our transfer vehicle. We will begin our trek to Kukku ka Nalaa. Don’t forget to watch the beautiful wood carving on doors and walls of houses en route to our campsite. Arrive at Kukku Ka Nalaa Camp. Explore the surrounding areas and take ample photos with the group, selfie and the scenic beauty of snow-capped mountains. Enjoy the start of the with delicious breakfast. Today will be our most tiresome day of this day as we will ascend to Kharmindari passing the settlements of Nomadic tribe called as Gujars. We will also pass a water stream before reaching our campsite at Kharmindari. 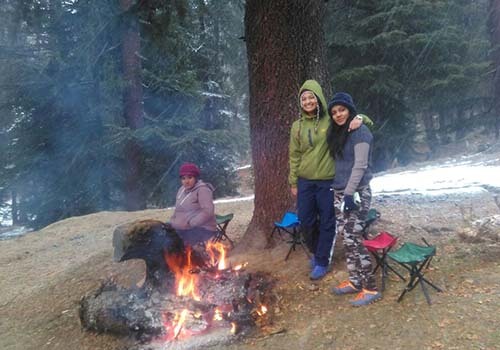 As this place is surrounded by many Snow Peaks it is an ideal destination for camping. We will move to the view the Deo Tibba Peak. For that we will have to walk uphill for around an hour or 2 where we leave the tree line. This will enable us to view the entire region. Once gaining maximum height, we will be able to see the Bara Bangal range and Manali town from our trail. After taking ample pics and filling the memory completely with the view, we head back to Kharmindari to enjoy our last night of the trek. Post breakfast we will head to Jobri. Trek to Jobri is through forest of coniferous trees which will offer you a memorable experience. After reaching Jobri, our transfer vehicle will be waiting to take you back to Manali, along with all the fond memories from this trek. Don’t forget to share the feedback of your experience of the trek before bidding adieu. ● Tents, sleeping bags, (Oximeter, Oxygen cylinders in case of emergency) and well-stocked First Aid kits. ● Depending on route, Comfortable Guesthouses and Home Stays at Base Camps or in High quality tents on triple sharing basis. ● Hygienic food by experienced camping cooks. Majorly vegetarian food provided. ● Besides Trek Leaders, every batch has sufficient support staff including Local Guides, Cooks and Helpers. 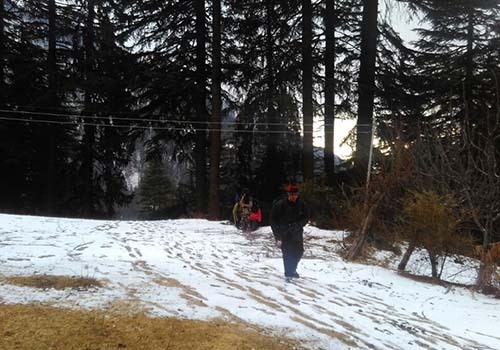 Porters too are provided on demand for carrying Personal Rucksack. ● Transportation from Manali to Manali, Transport is being provided in small vehicles or SUV’s to ensure safe ride. ● A photocopy of your Identity Proof (Passport / Voter ID Card/ PAN Card/ Aadhar Card/ Driving License). ● Rucksack – If you are offloading your Rucksack, you will need a small Daypack to carry your basic essentials. ● Good Trekking Shoes and a Pair of Slip-ons, if required for use at Campsites. ● 2 Water Bottles (1 litre each). ● Woollen or Fleece Gloves and a pair of Waterproof Gloves. ● 2 Collared and Full Sleeved T-shirts – Do not carry loose T-shirts as they tend to make you feel cold. ● Ready to eat Snacks, Enerzyl Powder or Glucon D Powder – Carry nuts, Dry fruits, Energy Bars to munch on during the trek. They provide instant energy whenever it hits the lower base. ● Cap, Sunglasses - Do ensure that your sunglasses are UV Protected. Do not carry reflectors. ● Any medicines that you normally consume - Please consult your doctor in this regard. Our (Small Steps Adventures) primary concern is the Safety and Well-being of all the Trekkers. In pursuance of this responsibility, we have the Right to amend or Cancel this Program due to Weather Conditions or Change from Time to Time due to Personal Health Problems by the Participants. Small Steps Adventures, will not be responsible for the Weather, Health Related, Political Issues. We ensure you a Memorable Trekking Experience with us. We always try to give you information about any changes in the Schedule/ Itinerary, if there are any, as soon as possible we receive it. If any trekker is cancelling his/ her seat due to personal reasons no refund will be payable in such circumstances.